Back in the day, The Who did a song, "Going Mobile," about the joys of jettisoning an old life and hitting the road as a carefree, "air-conditioned gypsy." Fiftysomething photographer Fran Reisner actually has had the nerve to give the mobile lifestyle a try. 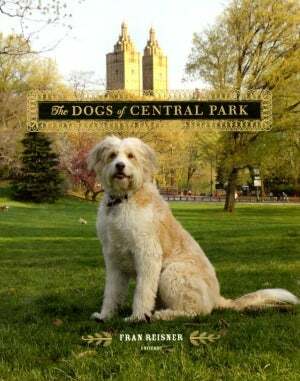 Last year, the former Dallas resident, author of a 2011 book of whimsical canine portraiture, The Dogs of Central Park, decided to simplify her life after her daughter left for college. Reisner sold her home, got rid of most of her possessions, and took her business on the road. She brought along her two dogs and only what she could fit in a Winnebago. Reisner filled me in on what she's discovered about living and running a business on the go. FR: The experience has been amazing. I don't miss my home or things. What I feel is free, unburdened and excited about each new day. Where my life was once so pre-designed and controlled by me (to some extent... didn't always work out as planned) I am now living with blind faith that the road will open itself up to me. Other than a few projects I'm working on, such as The Mountain Dogs of Colorado, which has me in Colorado right now, I'm happy not knowing what's around the next bend in the road. The mystery makes it exciting for me. FR: There was nothing simple about downsizing. Nothing! It was a grueling process in all honesty, and I did it in seven weeks' time. I purged 4,300 square feet worth of home and studio -- a lifetime's collection of things. What I have left is either with me or tucked in a 10-foot-by-10-foot storage space. People asked me many times during the process if it was difficult to let go of my treasures. My answer was always the same. "It's just stuff." I'd resigned myself to this understanding long before going through the process. I began to look at those things as an anchor in my life. Without them I am free and unburdened. It was not a pre-designed plan, but well thought out and handled in a very focused and organized fashion when the time came. Every hour of every day for seven weeks was lived out with sheer grit and determination, but then I've had a lifetime of practice of doing just that to a lesser degree. FR: I have made it a life-long goal to live as debt-free as possible and managed to keep it that way. My mortgage being my only real ongoing debt, and I was fortunate to have equity there. When the economy grabbed us all by the throats, and as I began the process of shutting down my business and had less income, I resisted the option of borrowing on that equity. Instead, I hunkered down and lived the last few years like a college kid -- very lean. That doesn't mean I'm retired by any means. I have a daughter to get through college and many years of living ahead of me. I am focusing on several projects right now that I believe will pan out. I am a determined and resourceful gal, and I trust that my efforts will generate income. I don't need much to live a happy and content life. That's one of the advantages of living a simpler life. FR: Most of my business over the last 20 years was shooting custom portraits on commission, and I'm still doing that -- people can contact me and we'll set something up when I'm headed their way. I'm also working on an online gallery of the art I'm creating as I travel. In addition, I'm working on more books in my dog series. SA: What did you actually keep and bring along with you -- in addition to your photography equipment, that is? FR: I kept the basics, and in all honestly, still more than I need. I'm unloading things as I go. It was hard to say what and how much I would need. I'm learning as I go. It was kind of like packing for a really long trip. Clothing, toiletries, linens, dishes, tools, a couple of lawn chairs. The toughest part was office stuff. I had no idea what I'd need, but I had to assume I'd need at least the basics. I took my laptop and some backup drives, and ditched my big printer and bought a smaller one. FR: This, I have to admit, has been a struggle for me. It was my habit to lay things out in an orderly way, lined up in order of priority. My bills to be paid in a file in my desk drawer. My folders of projects hanging next to me on the wall. My file cabinet (BIG) in the closet behind me. My stapler and tape and adding machine in front of me, and pens and highlighters and markers in the drawer. My printer on a shelf above my computer. Paper and notepads close at hand. Lack of that space is still taking some getting used to... but what makes officing most difficult is that I can't leave things laying out while driving down the road. If I do, they are guaranteed to end up in a heap on the floor. I know this from experience. FR: So far most of my travel has been a meandering path to places I knew I wanted to see, or people I wanted to spend time with... family and old friends. The joy is not only in seeing those people and places, but everything in between. It's a beautiful world out there! Some of it is planned, though. I knew I wanted to be in Colorado in the winter to work on my book, and as time (and I) drew near, I did have to do some planning... the exact itinerary coming together only days in advance of my next destination here. Interestingly, I am traveling Colorado by car. I left my RV in Arizona, winterized just in case of a deep freeze while I'm away. Since I'm here for at least three weeks, and not knowing what weather I might encounter, it seemed smarter to travel in my all-wheel-drive Honda through the mountains in the dead of winter. Now, much of the planning is finding pet-friendly accommodations as I go, and I'm changing locales every few days. The biggest frustration is lack of consistent internet connection. Most RV parks have free WiFi, but it's often weak at best. I have a little personal WiFi device, but my plan is not inexpensive, and the data (upload and download) is limited. Since photographic images are big and take up a lot of bandwidth, I try to find a good free connection for blogging and such. This is almost always a source of frustration for me. FR: This life is certainly not for everyone, and driving a big RV would not be for the weak of heart, but I hear a resounding choir singing "I would love to do what you're doing!" I'm very happy with my decision. But I wouldn't necessarily recommend jumping off the high dive, as I did, as the best way to start. If you've never owned or traveled in an RV, try renting one first and taking it on a long road trip. There's more to this life than meets the eye, and it's not all glamorous. For example, every time you stop [at an RV park], you've got to hook up the electricity, water and sewer lines, and then go through the reverse process when you leave. Campsites and fuel are not cheap, and then there are the regular maintenance costs for the vehicle, which can get costly. I think a good long test drive would be like wearing a life jacket when taking that first leap into the water. Probably the smart thing to do. FR: I miss being closer to my daughter (although I still see her every few months), and I miss my close friends. Other than that, no... not really. I have all the memories I can carry along with me. The rest was just stuff. If you want to follow Reisner's adventures, check out her blog and follow her on Twitter.